15.2 update installed, no spontaneous reboots, all apps working, all my recorded shows/series links in good stead. 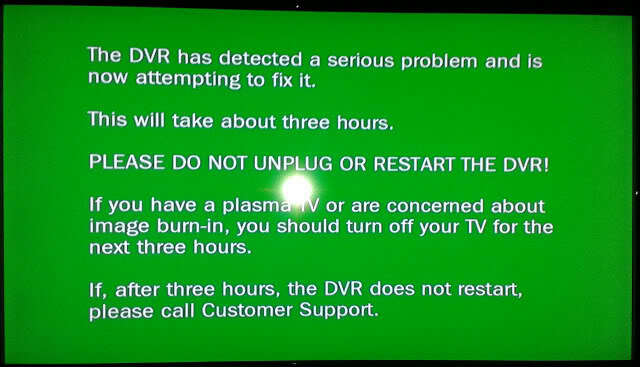 Now my 500GB TiVo is stuck in a loop, where a green "your DVR is being repaired" screen displays for a few seconds before it tries to start up again. And again. But never does. Guess I'll be needing a new one. Time to book an engineer! Damn shame, really; just as I was beginning to get some good use out of the TiVo. Asked my contact in CEO's office to book an engineer visit, mentioned it over at VM community forums, wonder what they'll say. I don't mind losing the shows on there so much as the worrying feeling that I'm going to have to wait weeks in order to have an engineer out to fix or (more likely) replace the box, assuming that it is a hard drive fault which some of the TiVo helpsites seem to suggest. I always thought the hard drive in there made unusual noises when booting up, similar to that of other ones I've had in PCs that are just about to develop a fault which SMART usually tells you about. I tried doing what are called TiVo KickStart Codes but due to the fact the VM TiVo is different from the Premiere in terms of front LEDs and firmware I haven't been able to get to any of the described diagnostic menus to do tests. Here's a pic of the green screen anyway. Just got a tip on how to fix this, and so far so good. Still worried that the HDD is a troublemaker but the TiVo is usable now. Assuming that it doesn't GSOD again it should be golden. Great to hear you've managed to bring it back to life. Fingers crossed that there isn't an underlying fault with the HDD though. Hopefully not a HDD problem, yeah... interesting thing is since the fix some of the new options I wasn't seeing after having upgraded from 15.1 to 15.2 are there, for example after the upgrade there weren't parental lock controls for all the Apps but now there are. That is certainly an interesting observation. Maybe the update didn't complete correctly for what ever reason? I suppose it's possible... who's to say that people having problems with frequent crashes and reboots couldn't have their problems fixed by using the same method I did rather than a brand new box? NOTE: I'd go into detail about what it involves (no it doesn't require opening the TiVo!) but to be honest I was told in confidence and don't want to break that trust! What is the tip. The reboots are driving me nuts.